If the world is to confront the challenges of mitigating and adapting to climate change while meeting the demands of a rapidly-growing global population, it is vital that we find the balance between conserving and regenerating forest areas with economic growth for poverty reduction. Forests and trees contribute to economic growth, employment, food security, and energy generation, and are key to helping countries respond to climate change. Forests support rural economies in many countries and provide jobs for populations with few alternative off-farm employment options. Forests produce more than 5,000 types of wood-based products, and generate an annual gross value add of just over US$ 600 billion, about 1% of global GDP (in some countries that contribution is much higher, reaching for example 6% of GDP in Cameroon). Forest goods provide an important “hidden harvest” for rural populations, keeping many people out of extreme poverty. About 350 million people who live within or close to dense forests depend on them for their subsistence and income. Of those, about 60 million people (especially indigenous communities) are wholly dependent on forests. They are the custodians of the world’s remaining intact natural forests. Forests are an important source of energy for many countries; 65% of the total primary energy supply in Africa comes from solid biomass such as firewood and charcoal. Wood-based fuel will be a key source of energy in low-income countries for some time and is increasingly viewed as a "green" alternative to fossil fuels in developed countries. Given this demand, forests need to be managed sustainably and clean, safe cooking methods encouraged. Forests generate essential services that sustain key sectors (agricultural, energy, water, mining, transport and urban sectors), by helping to maintain soil fertility, protect watersheds, provide habitat for a variety of species, and reduce the risk of natural disasters, including floods and landslides. One of forests’ most crucial services is their capacity to slow climate changeby absorbing CO2 released from the burning of fossil fuels through photosynthesis. At the same time, deforestation, forest degradation and land use change contribute about 12% of the world’s greenhouse gas emissions. Many of the world’s remaining forests are under increasing threat due to agriculture expansion, timber extraction, fuelwood collection and other activities. Although the pace of global deforestation has slowed since the 1990s, it remains high with about 13 million hectares (gross) lost each year. This is partially offset by reforestation, making the total annual net forest cover loss 5.6 million hectares—an area larger than Costa Rica. Some 2 billion hectares of lost or degraded forests and landscapes could be restored and rehabilitated to functional and productive ecosystems. This would help generate economic opportunities in rural areas, deliver improved rural livelihoods and food security, strengthen climate resilience and mitigate greenhouse gas emissions while taking pressure off pristine forests. To meet the wood product, energy and food demands of a rapidly-growing global population, in addition to climate adaptation and mitigation goals, forests must be managed sustainably to provide multiple benefits for economic development and ecosystem services. As such, the World Bank’s Forests Strategy supports countries in their efforts to harness the potential of forests to reduce poverty, better integrate forests into their economies, and protect and strengthen the environmental role forests play—locally and globally. Since the adoption of the FAP in 2016, World Bank commitments on forests have increased from US$1.8 billion (FY16) to US$2.3 billion (FY18), and IFC investments grew from $24 million (FY16) to 118 million (FY18). In April 2016 the WBG launched its Forest Action Plan for Fiscal Years 2016-2020 that focuses on two priority areas: investments in the sustainable forest management; and “forest-smart” interventions in which the World Bank Group takes a holistic look at forest landscapes, so that its work in sectors like agriculture, transport and energy does not erode forest capital but instead generates positive forest outcomes. WBG is increasingly supporting its country clients to implement such an integrated approach. The Plan is underpinned by three cross-cutting themes that are key for progress on forests: climate change and resilience, rights and participation, and institutions and governance. Maintaining and restoring healthy forests is key to mitigating climate change and building resilient landscapes. Good forest governance and strong institutions are core conditions for sustainably managed forests. Clear ownership, access, and management rights over forests are also vital to build forest-dependent communities’ assets, create jobs and manage forest resources more sustainably. Continuing dialogue and exchange with civil society, private sector and other groups is central to the implementation of the Plan. Increasingly, the World Bank Group strives to combine World Bank financing instruments with other sources of financing for larger, more integrated programs that enhance impacts on the ground. Additional financing sources include innovative forest-related funds like the Forest Carbon Partnership Facility, the Forest Investment Program, the BioCarbon Fund Initiative for Sustainable Forest Landscapes, and the Global Environment Facility, and private sector partners. In Mexico for example, the Forest and Climate Change project taps about $460 million from multiple sources of forest finance to advance sustainable forest management and climate action through community forestry. Private sector commitment and action around deforestation free commodity supply chains will be critical to conserve forest resources and reduce risks for businesses who rely on commodity supplies. In Ghana, for example, the Bank is working with the IFC in the cocoa sector to promote private sector practices that reduce deforestation and degradation in Southern Ghana. Other public-private compacts on reducing deforestation from supply chains are underway in Zambia around cotton production, in Ethiopia around coffee production, and in Liberia around rubber production. 1,600 farmers have received technical assistance for low carbon agriculture practices. Reduced soil erosion by 68% and provided an example for forest-based carbon sequestration. Established 84,000 hectares of project model plantations on degraded and saline sites outside the project area. In Mexico, where some 80% of forests are owned by indigenous and other communities, the World Bank has been supporting the Government with a series of projects that have increased sustainable forest management, forest-related jobs, and the net value of forest goods and services. Since 2012, this effort has been extended to all 32 states in Mexico, supporting an additional 1,000 communities and bringing 2 million hectares of forests under sustainable management. The $460 million Forest and Climate Change project in Mexico taps multiple sources of forest finance to strengthen community institutions and knowledge of forest management and conservation while also developing alternative sustainable sources of income, including through REDD+. Similar support in Lao PDR resulted in over 400,000 people benefiting from improved management of 1.3 million hectares of forests. In Vietnam, more than 43,000 households have received access to micro finance and technical support to establish over 76,500 hectares of forest plantations under a World Bank-supported project from 2005-2015. In the Democratic Republic of the Congo (DRC), the Pro-Route project reduced potential negative impacts on forests from rehabilitating a road through a forest-smart development approach that included participatory mapping of existing forest use, support for income-generating activities, and improved agricultural productivity to reduce agricultural expansion.. In the Republic of Congo, a recently finalized roadmap for balancing mining development and forest conservation supports land use planning for forest-smart development outcomes. In Senegal, the Sustainable Participatory Energy Management Project (PROGEDE by its French acronym) helped combat Senegal’s rapidly growing demand for household fuels and the associated degradation of forests and the rural environment. The Sustainable Woodfuels Supply Management Component of the project directly benefited some 250,000 people and established a sustainable incremental income from wood and non-wood products of about $12.5 million per year, equivalent to $40,000 on average per participating village. Of that amount more than $3.7 million (30 percent) resulted from women-led economic activities. In Liberia, the World Bank, through the Program on Forests, helped roll out a "chain of custody" system that tracks timber from forests to the point of export through barcodes and data forms. That system combated illegal logging and assisted in securing more than $27 million in net tax revenue for the state in 2008–2012. The Liberia Forest Sector Project is building on this success to further strengthen governance and institutions. In Belarus, the World Bank provided support for the formulation of policies and strategic planning underpinning the development of the country’s afforestation capacity, yielding an increase in forested areas from 35 percent of the country’s territory in 1994 to over 39 percent in 2013. The Bank also supported activities against illegal logging and associated forest-product sales. In Kazakhstan, the Forest Protection and Reforestation Project rehabilitated more than 46,000 hectares of forest degraded by extensive forest fires, installed a new state-of-the-art fire detection system, and established new community-based forest management approaches. In Moldova, where the majority of poor communities depend on agriculture for their livelihoods, the Moldova Agriculture Competitiveness Project is increasing the use of sustainable land management practices like forestry shelter belts, which can limit soil erosion and sequester carbon, while contributing to greater returns for farmers. The World Bank works with a wide range of stakeholders and partners at the country, regional, and global levels. The World Bank places special emphasis on partnerships that can deliver operational support to client countries through coordinated efforts. Platforms established under the Forest Carbon Partnership Facility and Forest Investment Program (and its associated Dedicated Grant Mechanism for Indigenous Peoples and Local Communities) have deepened the World Bank’s engagement with a variety of stakeholders involved in the forest sector. The Program on Forests (PROFOR), a multi-donor partnership hosted by the World Bank, generates forest-related knowledge that helps inform World Bank forest sector investments. 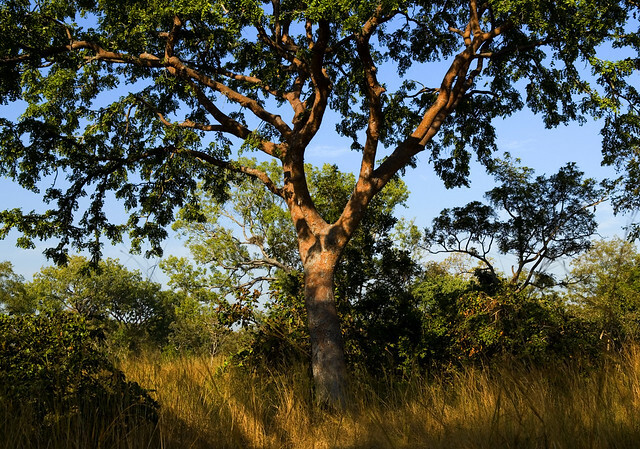 The World Bank is a member of the Collaborative Partnership on Forests, a group of 15 international organizations and secretariats with substantial programs on forests that coordinate to promote sustainable management of all types of forests and to strengthen long-term political commitment to this end. The World Bank also works closely with the Global Landscape Forum; the Global Restoration Council; the Global Partnership for Forest and Landscape Restoration; the AFR100; the LAC 20x20 and the Tropical Forest Alliance. Through the European Neighborhood and Partnership Instrument East Countries Forest Law Enforcement and Governance II Program (ENPI FLEG II), the World Bank supports Armenia, Azerbaijan, Belarus, Georgia, Moldova, Russia and Ukraine in their efforts to improve forest law enforcement and governance. Through its private sector arm, the International Finance Corporation, the Bank Group also encourages responsible corporate investments across the forest products supply chain and works to create a more level playing field for legitimate forest-sector enterprises that adopt sustainable forest management practices. FEATURE STORY: WhatsApp-ening with Forests and Climate in Togo?